At The Nysmith School, we fan the fires of imagination and creativity that our children will use to light the world. We believe that learning is a joyful experience. Our goal is that every Nysmith student will love coming to school every day. When you come to visit us, you will see the fun that results from exploring intellectual content together. We are committed to guiding students through a world-class, enriched curriculum, in ways that engage students and build critical thinking and collaboration skills. Since repetition is kept to a minimum, Nysmith teachers are able to build their courses around analysis and discovery. Every Nysmith teacher works to develop leadership and collaboration skills from prekindergarten through eighth grade. These “soft” skills are essential for a happy and successful life. Language arts teachers have created courses to develop a love of literature in students who define themselves as math people. Students who were passionate about math and science in Nysmith’s middle school are now in the performing arts. Nysmith alumni in medical fields tell us that they still love literature because their Nysmith teachers inspired them. Nysmith teachers have designed courses to develop students’ love for all academic disciplines. Science specialists have created labs and experiments that show students the thrill of discovery and exploration and lure them into loving science. 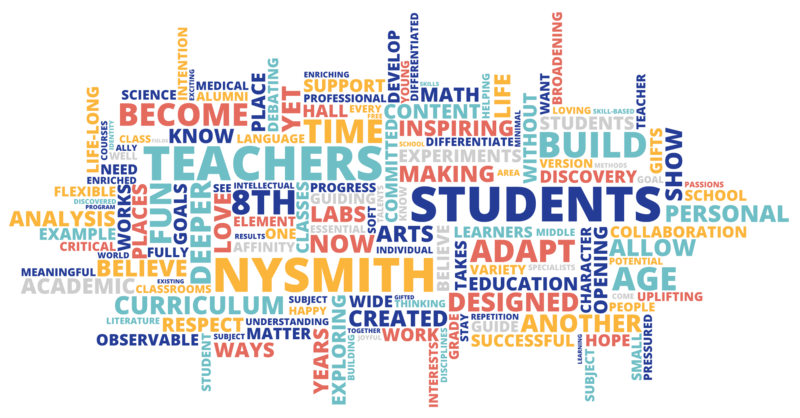 The goal of every Nysmith teacher is to instill a love of their subject area into every student – both those who have an affinity for their area and those who have not yet discovered their passions. Low teacher-to-student ratios allow us to differentiate, so students can see the progress they are making without being pressured to move in sync with other students. Inspiring students – balancing challenge and support – builds a life-long confidence and love of learning. Our academic content is several years above grade level, but the methods teachers use are age-friendly. This makes learning experiences meaningful, successful and fun. Nysmith teachers are committed to helping each student become the best version of themselves. Our program guides young people into a deeper understanding of their identity, their personal goals, and their social skills. The Nysmith character education classes and the language arts classes are the most visible places where this work takes place. Individual students are the heart of our school. Our highly experienced teachers are free to adapt their curricula to the needs and interests of the students in their classrooms. This allows teachers the maximum freedom to build on their students’ existing strengths and passions. You will see Nysmith students chatting or debating academic content as they walk down the hall. You’ll hear them laughing with each other and their teachers. You’ll note the deep respect that students and teachers have for one another.